Were you invited on a fancy event on a cold weather? You shouldn’t suffer in order to look smart. Choose a pair of simple, but elegant boots to feel warm to your feet. Also, a pair of boots with a superior cushioning is really comfortable. 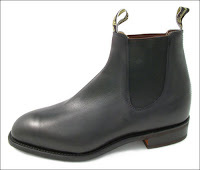 RM Williams Comfort Craftsman represents a prudent choice in a cold daabty.